Following the stunning announcement by the Bureau of Reclamation (USBR) on Friday, April 1, 2016, of a 5 percent water allocation for Federal water users south of the Delta, Patrick Cavanaugh, deputy editor with California Ag Today interviewed Louis Moore, deputy public affairs officer with the Bureau of Reclamation (Reclamation) Mid-Pacific Region based in Sacramento regarding justification for the low allocation for the Central Valley during this El Niño year. Cavanaugh: We are all stunned in Central California with that 5 percent water allocation to Central Valley Project water users. With so much hydrology in terms of rain and snow this winter, it seems impossible that farmers and cities could only expect 5 percent! Moore: Yes, understood. I will try to explain what our logic is behind the 5 percent allocation. Cavanaugh: Yes, I would like just one reason for the 5 percent. We cannot imagine why so much water is going to waste. Moore: So basically when we looked at the hydrologic conditions in preparation to make the allocation announcement, we found that regionally, water has fallen differently in the various basins. There was substantially more rain and snow in the mountains in the Oroville and Shasta Dam areas that caused those reservoirs to increase storage quite rapidly. Over at the New Melones Reservoir, which provides water to the south, the storm systems did not materialize and did not produce large sums of runoff; therefore the reservoir storage is low. Cavanaugh: But the snow that could fill New Melones has not yet melted. And, as you said, there is a lot of water in northern California, and there is a system to get it southward to farms and cities. Moore: So this is the initial allocation that is out today. We are hopeful that conditions will improve; and if they do so, we can make an adjustment to what the allocation is. 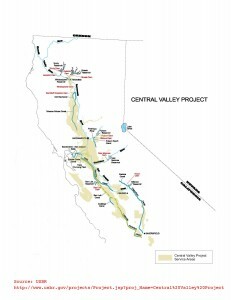 Cavanaugh: You did not mention San Luis Reservoir, a major reservoir jointly run by the state and federal governments that could have had more water pumped into it during the recent high flows, particularly given the flood releases from northern California. Moore: Water is being pumped into San Luis, and it is for a combination of reasons. Sometimes the natural runoff causes different flows into the systems, but we have to regulate the water that goes through the Delta. San Luis is a shared Federal and State reservoir with legal criteria under which we operate. So we have to be very careful about what waters we can push through the Delta. But we were still providing water to that system. 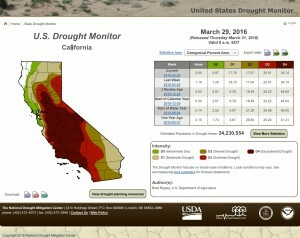 Cavanaugh: Well, Louis, clearly more water should have pumped into the San Luis Reservoir. On April 2, it was only 52 percent full and, given the flood releases, it should have been more. Californians on farms and cities south of the Delta are frustrated. They assert that far too much water is wastefully flowing out to the ocean—way more than necessary for the protection of species and the prevention of salt-water intrusion. Please explain why so much fresh water, nearly 800,000 acre-feet have flowed out to sea. 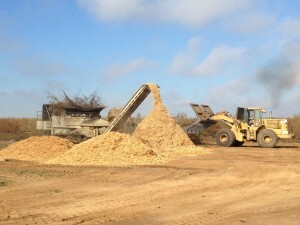 Moore: We operate to meet endangered species requirements. We operated to meet water delivery requirements through these various systems. These are federal/state requirements and biological opinion that we are operating to. We are trying to make sure we are following the law, so there are combinations of things where Reclamation works with its partners to determine where and how to get the water where it needs to be. Cavanaugh: Inflows into the Delta were as high as 300,000 acre-feet of water per day, and only a fraction of that has been moved into San Luis with a capacity of 2 million acre-feet. We understand why San Luis is not filled during drought years; but in an El Niño year like this, it’s confounding how Reclamation could justify an initial 5 percent allocation. It defies any logic, all the water, all the flood releases and the 95 percent on-average snow in the Sierras. Again, how can it possibly be justified? Moore: What I can say is there is absolute consideration and we understand the impact this has on our customers. One of the reasons we waited until April 1 to make this allocation announcement is because we have been hopeful. We have been looking at the storage, snow and runoff to see if conditions improved enough, so we could actually increase what we thought was going to be a worse allocation. 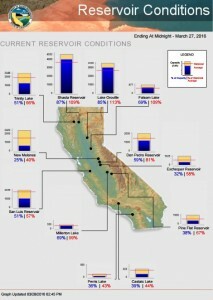 Cavanaugh: Well, it’s laughable—only 5 percent for San Luis, with all the water in the system from the El Niño year! You’re still not answering the question. None of this makes sense to anyone who is a critical thinker. Can you please explain, other than preventing salt-water intrusion and protecting species, why so much more water—over the top—was sent out? Moore: We are still coming out of the fourth year of dry conditions and that’s not news for folks. The dry conditions that we came through up until the fall of 2015 really impacted our ability to move water downstream into San Luis, which is the same water that can be provided to folks south of the Delta. We completely understand that, but we are talking about timing of the water supply that we received. Of the additional 4.4 million acre-feet of water that we received over the past several months, 2 million-acre feet occurred in March, which was late [for purposes of allocation analyses]. So we are just getting the sum of this water into our system. And we are still hopeful that [these late hydrology] conditions will improve and we can provide additional water. Cavanaugh: We know that Fresno received 135 percent of normal rainfall this year; it was wet throughout the area. Five percent was stunning to all of us. We know that farmers will never see 100 percent any longer. And possibly we will never see 80 percent any longer. I mean we could have record flooding throughout the state and farmers may not see a 50 percent allocation—even if the Delta Smelt were proven, unfortunately, to be extinct. Moore: Yeah, I do hear you. But there is a lot of work that goes into developing water deliveries and a lot of coordination as well. I am not blaming it on the laws, but when we sit down at the table with all the interests for water, it literally becomes a discussion on how to distribute the water and meet all that demand. Now we come to these agreements to meet the legal obligations, to meet the contractual obligations and to protect the environment. So this requires a lot of effort. Cavanaugh: Louis, I do not get what you are saying. In fact, I disagree with what you are saying. The family farming interest got a zero allocation two years in a row, but the environment still got all the water they wanted. So Reclamation is not sitting down with all the interests for water. The environment gets 100 percent of what they need while everyone else get far less—including zero two years in a row—and now only 5 percent. Moore: That’s part of the legal requirement that we have talked about. It’s absolutely one of entities at the table that has to be managed. Cavanaugh: Does the Bureau of Reclamation understand that all this water being used for the environment has not really helped the protected species in the Delta? The species continue to decline despite farmers going without water, fallowing land, and laying off workers, and in spite of devastating communities and severely hurting the economy in the Central Valley. Cavanaugh: Can you help us make this happen? Moore: You know, this is an ongoing discussion, I assure you. You probably see all the legislative reporting that’s done about water management. It is these discussions that somehow need to culminate into the change that you are mentioning.